Wednesday July 10th 1889 I had a bad spell of pain when I first got up this morning but felt better later on. Mother went over to Fannys to dinner and come back to Hatts for supper. I got the meals and worked on my quilt Will is putting up his hay which is a heavy yield. 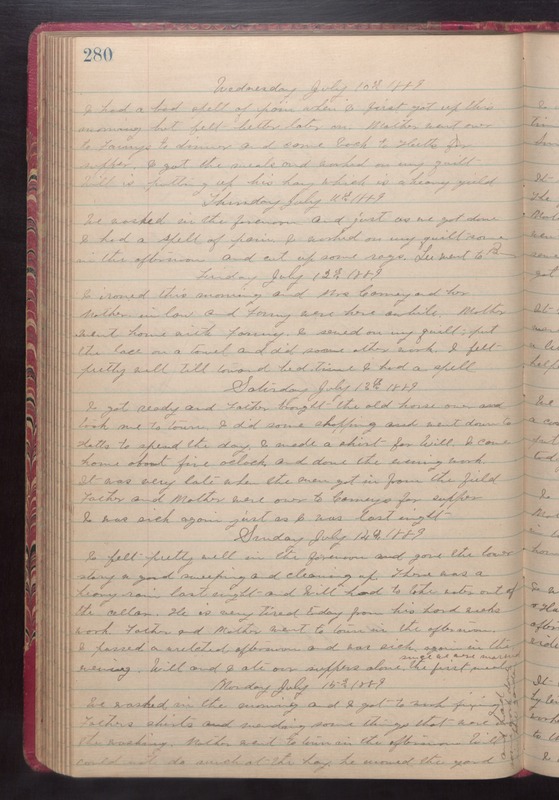 Thursday July 4th 1889 We worked in the forenoon and just as we got done I had a spell of pain. I worked on my quilt some in the afternoon and cut up some rags. Lee went to B-- [probably Burlington, Iowa has used this abreviation elsewhere]] Friday July 13th 1889 I ironed this morning and Mrs Carney and her mother in law and Fanny were here awhile. Mother went home with Fanny. I sewed on my quilt; put the lace on a towel and did some other work. I felt pretty well till toward bed time. I had a spell. Saturday July 12th 1889 I got ready and Father brought the old horse over and took me to town. I did some shopping and went down to Hatts to spend the day. I made a shirt for Will. I come home about five oclcock and done the evening work. It was very late when the men got in from the field Father and Mother were over to Carneys for supper I was sick again just as I was last night. Sunday July 12th 1889 I felt pretty well in the forenoon and gave the lower story a good sweeping and cleaning up. There was a heavy rain last night and Will had to take water our of the cellar. He is very tired today from his hard weeks work. Father and Mother went to town in the afternoon. I passed a wretched afternoon and was sick again in the evening. Will and I ate our supper alone. The first meal since we were married. Monday July 15th 1889 We washed in the morning and I got to work fixing Fathers shirts and mending some things that were in the washing. Mother went to town in the afternoon. Will could not do much at the hay. He mowed the yard [the following text is written vertically in the right margin of the above entry] and had some work done in the garden.